With his last chance to command the white pieces in a regulation game in the World Chess Championship, defending champion Magnus Carlsen was unable to drum up any attacking chances. Game 11 — like the 10 that preceded it — ended in a draw. Carlsen’s challenger, Fabiano Caruana, defended admirably and the two are tied 5.5-5.5 with one regulation game to go. Saturday’s game began with the Petroff Defense, Caruana’s favorite opening with the black pieces. Not surprisingly, this was familiar mental territory for the No. 1 and No. 2 players in the world. Within 90 seconds, they’d blitzed out their first 10 moves, arriving at the position below. This specific choice of opening was interesting for two reasons. One, Sergey Karjakin, the 2016 championship challenger, won a game with the white pieces from this exact position in 2016, against the elite Indian grandmaster Pentala Harikrishna. Two, the infamous deleted video that appeared to show secret aspects of Caruana’s pre-match preparation once again reared its head. That video showed a laptop screen with a variation of the Petroff that included the move “9…Nf6.” And indeed, on his ninth move, Caruana moved his knight to the f6 square. But little else was interesting on Saturday. That “leaked” variation led to nothing sharp from either player and the secretive preparation unleashed no interesting secrets. Karjakin happened to be in attendance at the venue in London on Saturday, and he provided some early commentary for the viewers that has also become the mantric chant of this match: “It looks very drawish,” he said. He was right. The queens came off the board by the 14th move. Only a pair of bishops and some pawns remained by the 26th. Thirty fruitless moves later, Carlsen and Caruana shook hands. This is what an uneventful world championship draw looks like at high speeds. Come for the Petroff, stay for the bishop dance. “Not much really happened today,” Caruana said after the game, to a bit of uncomfortable laughter from the crowd. There is an austere beauty in the equilibrium of draws that this match has reached: Two goliaths, pushing each other with all their might, yet moving nowhere. At any moment, though, the ground can shift. The mounting draws bring both good and bad news for the American challenger. On one hand, Caruana has proved beyond a doubt his ability to hang with and even outplay Carlsen, perhaps the best player of all time, in lengthy games under the sport’s brightest lights. On the other, should the match remain tied after the final game, the two will move on to speedier tie-breaking games. I wrote about what those look like in 2016. Carlsen is rated No. 1 in the world in both speedy chess formats that will be used, and he is almost universally thought to be a heavy favorite in the tiebreaker. The match rests tomorrow. Game 12 — the final game of regulation and in which Caruana will have the white pieces — begins Monday at 10 a.m. Eastern. The tie-breaking games, if necessary, will happen on Tuesday. I’ll be covering it all here and on Twitter. Magnus Carlsen got a black eye before Game 9 of the World Chess Championship. But it didn’t hinder his vision of the board as Wednesday’s play began. 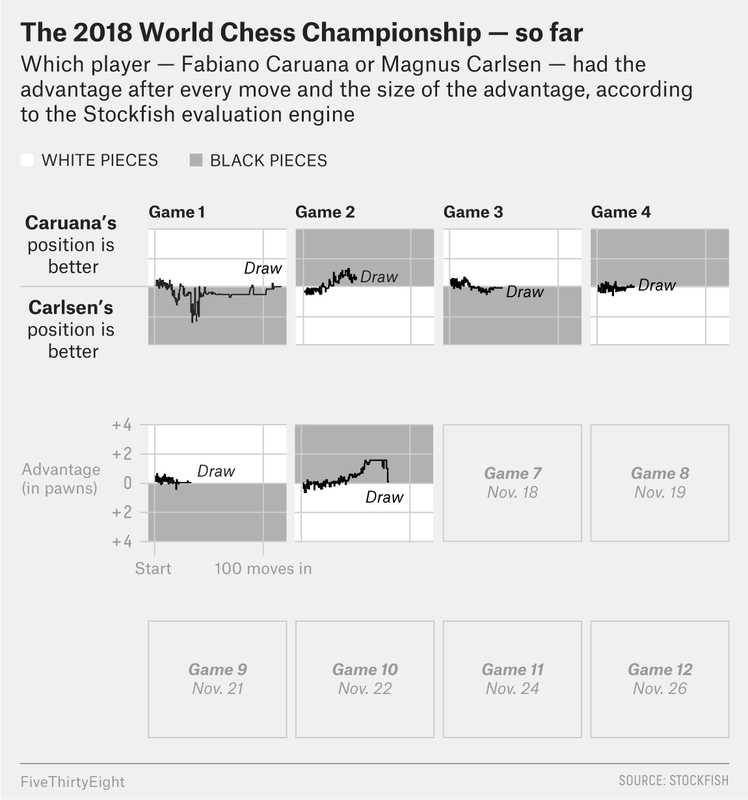 For the first time in nearly two weeks of play, Carlsen, the defending champion, was able to successfully command the white pieces to an attacking advantage. Throughout much of Game 9, Carlsen outdueled his challenger, Fabiano Caruana. Caruana, the world No. 2, appeared to reel at points, and his allocated time melted off his clock as he pondered his defense. But Carlsen’s advantage melted, too. The game was drawn after 56 moves over 3.5 hours of play. It was the ninth consecutive draw and the best-of-12 match sits level at 4.5-4.5. Before the game Wednesday, the list of colorful stories orbiting the match ballooned to two. 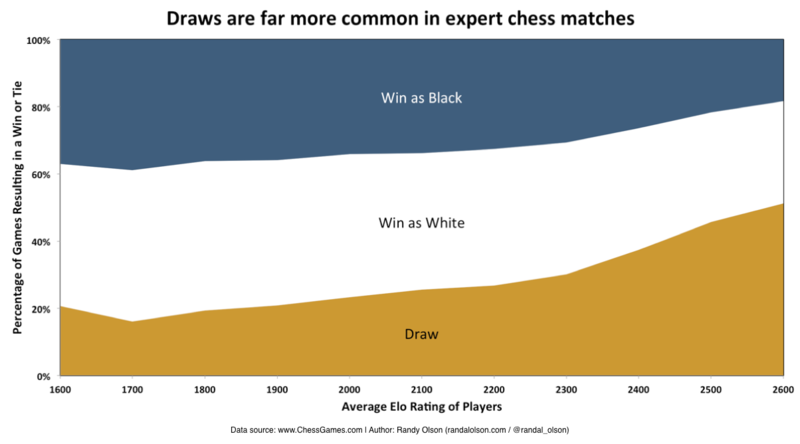 First came the infamous deleted YouTube video appearing to show elements of Caruana’s pre-match strategic preparation. Now we had the black eye. NRK, the Norwegian broadcaster, reported that Carlsen collided — excuse me, “kolliderte” — with one of its own journalists while playing soccer on Tuesday, a rest day from the chess. Questions were raised about Carlsen’s mental soundness — a grandmaster should do nothing but grandmastering, apparently. Per Google’s translation of NRK, he was reportedly “dumbfounded” after the crash. “If he has to use pain relief, there may be a potential problem,” NRK wrote. But those neurological questions seemed quickly answered at the board and Carlsen said he felt no pain while playing. The first eight moves on Wednesday exactly matched the first eight from Game 4 — their name sounds like something out of Tolkien, an English opening that became a Reverse Dragon. But the game took a radical and aggressive turn on move 9, when Carlsen scrambled his bishop to the g5 square, into enemy territory and with its mitre directly pointed at Caruana’s queen. This specific position has only ever materialized on a tournament chessboard once before, according to the ChessBase database, in an otherwise uncelebrated game in 2008 between two Croatian non-grandmasters. (Though black won that one.) The attack was on, and Caruana contributed with a misstep on his 17th move, capturing a knight in Carlsen’s territory that he oughtn’t have. That capture sparked a series of moves that eventually allowed Carlsen’s bishop to escape, flying across the board to capture the black pawn on b7. 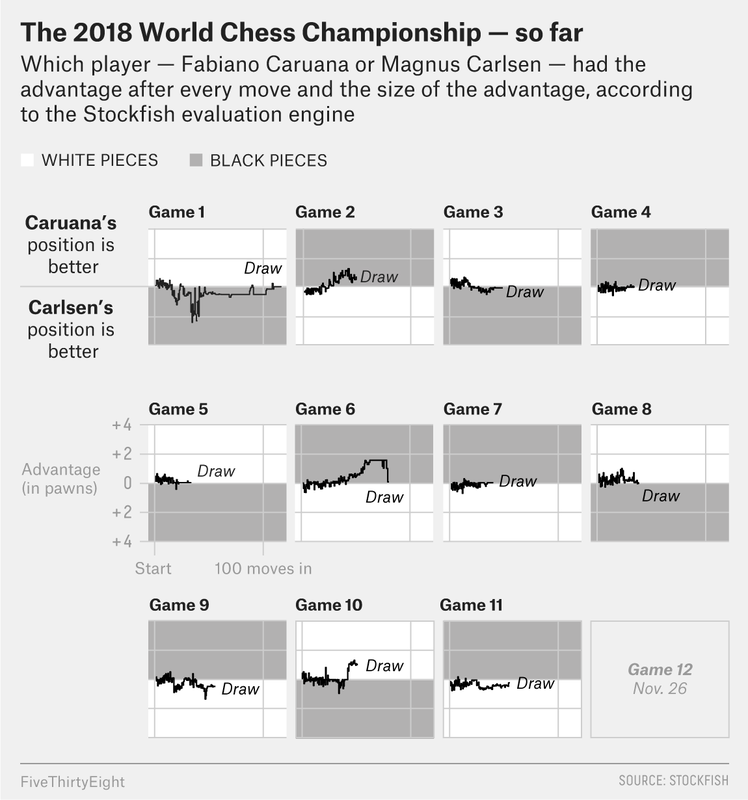 As deep into the game as the 18th move, Carlsen hadn’t spent more than a minute on any one move and quickly opened up a 40-minute advantage on the clock. One knock against the champ in this match has been his apparently lackadaisical preparation. But he was solidly prepared for his aggressive line on Wednesday, sailing through his moves. Caruana, meanwhile, took 9 minutes to make his 12th move, 21 minutes on his 13th, 8 on his 14th and 13 on his 17th. The fruits of the Norwegian’s preparation appeared to be a comfortable position: Either he would win or he would draw. Before Carlsen’s 24th move, the position looked like this. It appeared to all the world that the Norwegian chess superstar would finally make real progress in the match, and indeed that a victory in the moves to come would effectively decide the match — and the world title — itself. “There are certain types of positions where Magnus is stronger than a computer,” said Anish Giri, the world No. 5, on a chess24 broadcast. “He’s just not playing his best chess,” added Peter Svidler, the world No. 19, on that very same broadcast. The position simplified dramatically and the two shook hands — which they must be getting very good at — after 56 moves. Ah, chess is cruel. Here’s a chart to quantify that cruelty — and we’ll keep it updated throughout the rest of the match. There are three regular games left, and speedier tiebreaker games will follow on Nov. 27, if necessary. This match has been different for Carlsen than his 2016 World Chess Championship encounter against Russian challenger Sergey Karjakin, which began with seven consecutive draws. Many of those found Karjakin on the backfoot, escaping like Houdini from the shackles of the world champion. Caruana, however, has rarely been in real trouble until Wednesday, and this year Carlsen has been forced to play the part of escape artist. Carlsen would, however, be an enormous favorite should the tiebreakers become necessary. Game 10 begins Thursday at 3 p.m. Greenwich Mean Time — that’s 10 a.m. Eastern. But that’s also Thanksgiving. As a result, our next dispatch will come on Friday. 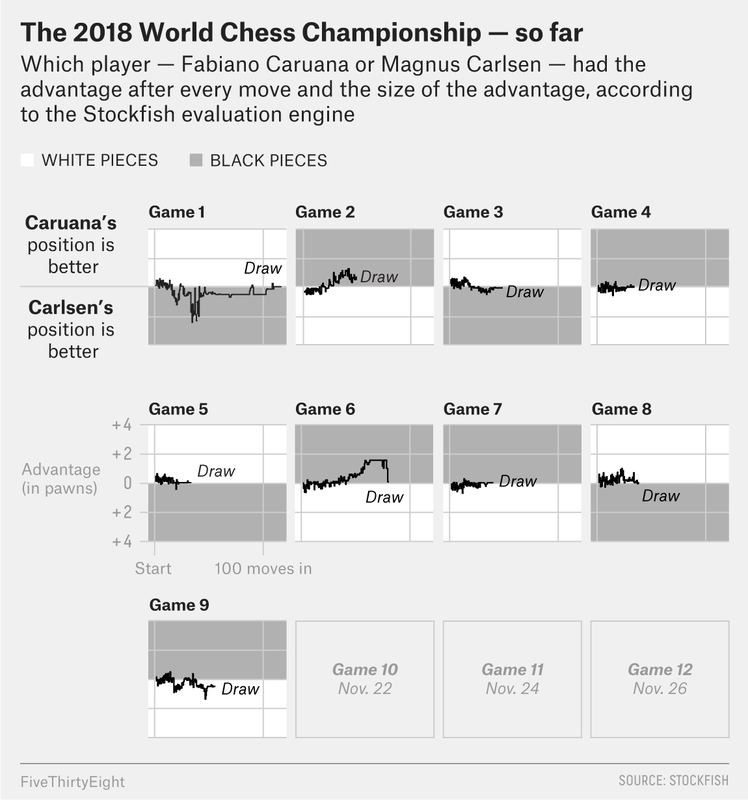 Chess waits for no turkey, but FiveThirtyEight does. I’ll be covering the rest of the match here and on Twitter.